Last week, Roshan took over the blog to share his favorite recipes – the Mixed Berry Parfait. A key component to a good parfait is a flavorful crunchy granola. Granola is one of those pantry basics, that many of us tend to buy off the shelf. Stores usually have a variety of flavors and combinations to offer but it’s so rewarding to customize your own version. 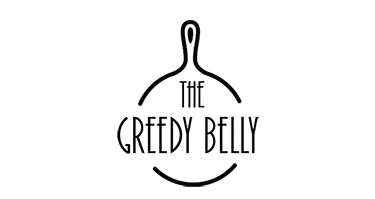 A basic granola is made up of a couple of different components – rolled oats, nuts, sweetener, dried fruits, healthy oil, spices, healthy seeds in all types of permutation and combinations. Rolled oats: This is core crux of any granola recipe. 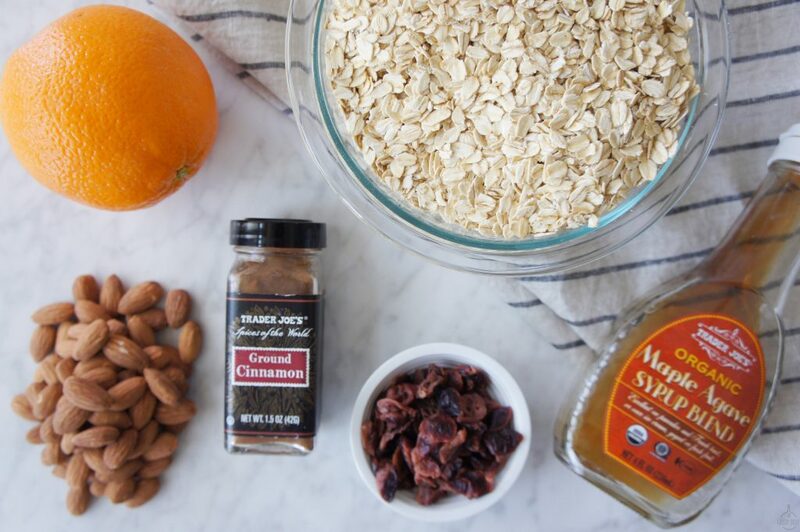 It all starts with some really good basic, healthy, hearty rolled oats. Nuts/ seeds: Nuts and seeds add the perfect crunch to your granola. Play around with this based on your liking and what you have in your pantry. Almonds, walnuts, pecans, pistachio, chia seeds, pumpkin seeds, hemp seeds, flax seeds are all good options. Sweetener: I typically like to stick to natural sweeteners like honey or maple. I also don’t like my granola to be over sweet so just a tiny bit goes a long way for me. Dried fruits: Dried fruits like cranberry, pineapple slices, mangoes, raisins not only add to the sweetness but also give it a wonderful chewy component. 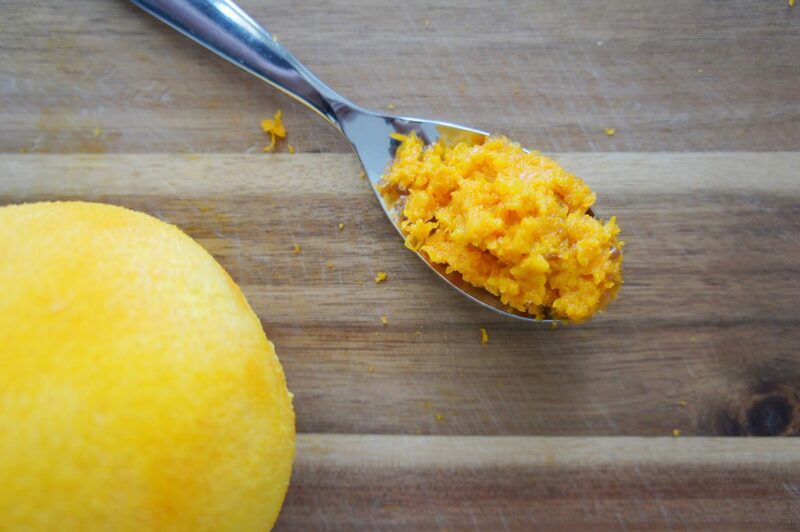 I also love adding fruit zest like orange zest. It gives it that additional brightness and freshness. Grated coconut is also a real good option. Spices: I love a dash of spice to my granola. Cinnamon and nutmeg are usually my top contenders. Ginger powder is also a really good addition for that little kick of spice. 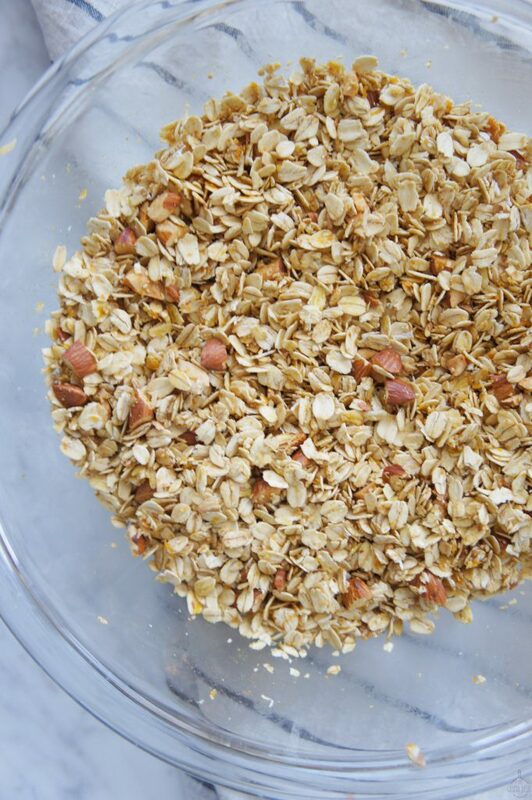 Healthy oils: The oil is mainly needed to roast the oats and help form the clusters. Coconut oil, olive oil and avocado oil go really well with most of the other ingredients in granola. This granola recipe is all about mixing and matching and finding your perfect combination. Don’t be shy to play around with it. Snack on it as is or use it as a topping on your yogurt or cereal, you are absolutely going to love it! 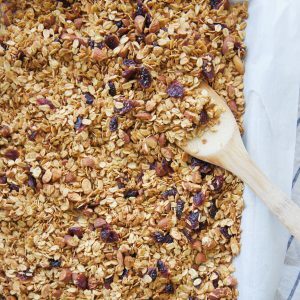 This homemade granola is sweet, crunchy, chewy and healthy. Mix and match and customize this recipe as per your preference. 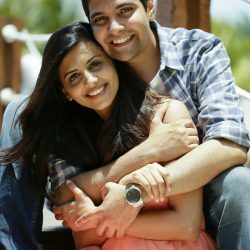 Your are going to absolutely love it! In a large bowl mix the granola, nuts, seeds, cinnamon and salt together. To this mixture add the olive oil, maple syrup, vanilla extract and mix well so that all the oats and nuts are well coated. 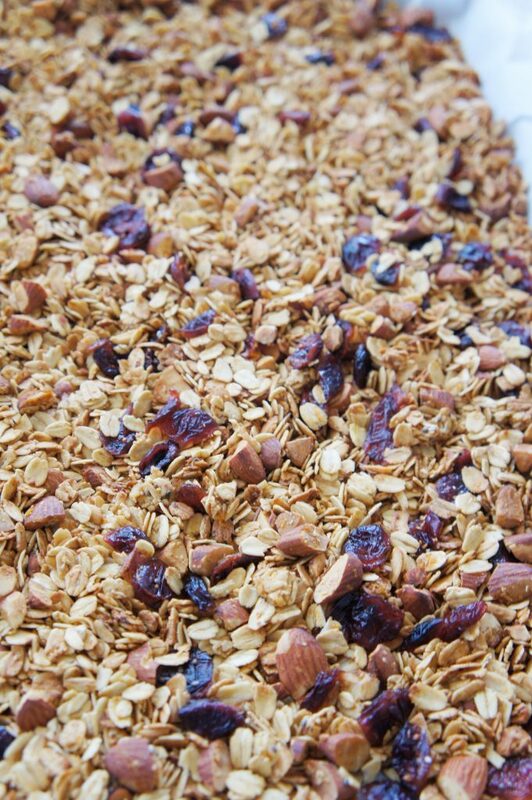 Bake the granola in the oven for 20-22 minutes, stirring it halfway. At the end of 20 minutes it should be a nice golden brown color. Add the raisins and pop it back in the oven for 2 more minutes. 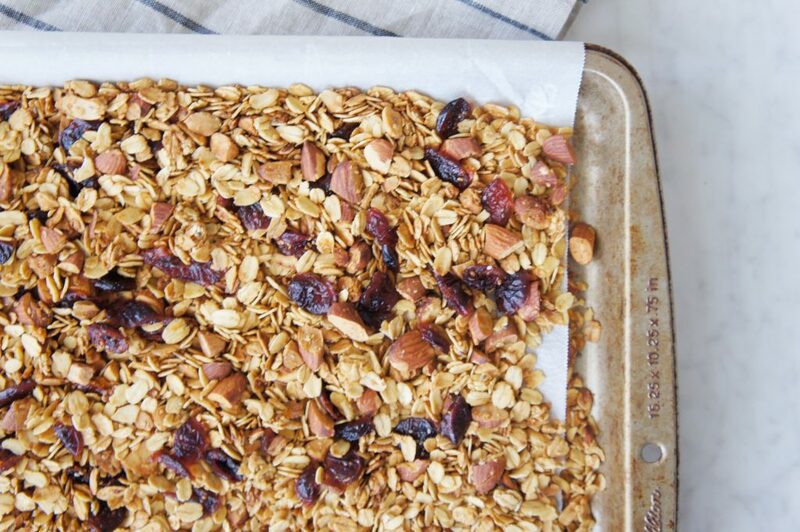 Pull out the tray from the oven and let the granola completely cool. It will continue to cook as it cools down. Once completely cool, store in air tight container for 4 weeks.